Macs. We love them. But they're not the friendliest things to upgrade. If you need more storage, and can't bear to scour through your hard drive deleting all those old files, there's basically no way to add more storage internally – but adding a Mac external drive is a breeze. Grab an appropriate USB hard drive, and you'll get fast storage that you can take around with you. External drives aren't just about more space for files, though. That expanded storage capacity is the perfect place to keep a backup of your main files, particularly if you can find a large hard drive capable of keeping both a Time Machine backup and a few extra files. If your Mac drive goes belly-up, you'll have an archive of everything – and using Time Machine means you also get the ability to, yes, go back in time. Older versions of files you've saved will remain available, so if you catastrophically save over something important you'll still have that legacy file to work with. We've picked out a number of drives, with different capacities, different skills, different levels of durability. Whatever your specific needs, whether it's a drive you're going to carry around or something you'll keep attached to your Mac at all times, there's something here to suit. Seagate's helpful inclusion of a Mac NTFS driver means that, formatted properly, this drive can be used to store files on both Mac and Windows systems without any of the incompatibility issues that so often crop up with Mac external drives. That's handier than you might think, particularly if you're going to use it to make two flavours of backup. It's cheap enough, it's completely inoffensive to look at with its slim metal case, and the Backup Plus 5TB has an absolute ream of storage for all of your files. It may not be the fastest, running at 5,400rpm, but that's a small sacrifice to make given the price. 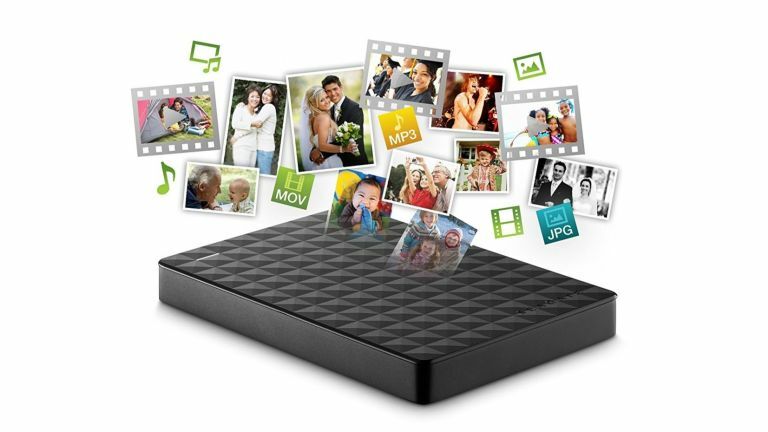 Let's start with the highlights: this is an 8TB external drive. That's huge. It's also an 8TB external drive designed by the masters at Porsche, clad in beautiful aluminium and classy enough that you'll put it front and centre on your desk rather than tucking it away in a corner. It's also USB 3.1 compatible. Power up the drive, plug it into a Macbook, and it'll both give access to that cavernous storage and provide power to the Mac with one single cable. That's super-handy, particularly given Apple's allergy to ports, and you may be able to get away without an external hub. It's not hugely portable, being a big lump of aluminium, and the Lacie hard drive is a little slow compared to some, but it's also USB 3 compatible (without the power passthrough) which does lend it a certain amount of versatility. External drives are the perfect thing to have slung in a bag for when you need them – but what good are they if a few knocks leaves a big scratch on your platter? Transcend's Storejet includes a number of levels of protection to stop your data being lost, from a floating design inside to a ruggedised outer shell that earns it military drop test certification. It's pocket sized, and similarly small in capacity, but the multi-function button is a great touch, allowing you to make a backup of your files with a single press. Need to make sure those files stay safe? You need this. An external drive is good for backups, but if there's a fire or something similarly catastrophic, it's possible that absolutely everything will be wiped out – including your backup. Unless, that is, you pick up a robust drive. A fireproof hard drive. A waterproof hard drive, a hard drive with theft protection, and one which includes a free data recovery plan in case of hardware failure. This is that drive. Yes, the price is high, but this is a lockable drive for those files that you simply can't afford to lose. It's fast, and fanless, so it'll sit silently looking after your files until the time comes that you really need them. Lacie's dual-drive effort lets you select what's most important using its RAID capabilities. You can either spread your data over the entirety of its 4TB capacity, or split it down, mirroring your files onto each of its 2TB drives so that you're safe if one of them should fail. Not that that's likely. The Lacie Rugged RAID is a well-protected drive, as evidenced by its hideous orange bumpers; perhaps this isn't the sort of thing you'll show your friends, but if you're interested in speed or reliability it's a very strong choice. This is an archive drive. It's not really meant for constant read/write use, more for the occasional big backup and to take care of those files you don't use very often. As such, it's not hugely quick, and using it leads to it getting rather warm. That said, its 10TB capacity is incredibly large, so if you're working with big files that's a huge plus. And the built-in USB 3 hub means it definitely earns its space on your desk – you can use the ports to extend those awkward-to-reach USB ports on an iMac, or charge your devices.